Make Sweet Lager Syrup by combining brown sugar, Lager Beer and butter in small saucepan; bring to boil over medium heat. Stir to dissolve sugar. Boil two minutes; cool to room temperature and set aside. 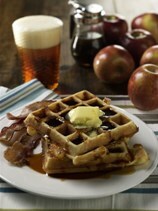 In large bowl, combine Belgium waffle mix, Pale Ale or Wheat Ale Beer, canola oil and eggs; stir until smooth. Stir in cheese. Preheat and lightly grease waffle iron. Pour about ½ cup batter onto waffle iron and cook three to four minutes, until golden brown, or according to waffle iron manufacturer’s instructions. Serve with Sweet Lager Syrup.